Iron Man Light-Up Christmas Ornament (Hallmark 2018) | Nerd Much? With fall officially arriving yesterday, chances are that you’re sippin’ your pumpkin spice latte while wearing your favorite hoodie. And while we love the fall season here at Nerd Much?, we’re also super excited for Christmas every year, because that means we’re getting more cool nerdy Christmas stuff. Hallmark has released their latest wave of new nerdy ornaments, and one of our favorites of the bunch is this brand new Iron Man with Light Hallmark Keepsake Christmas Ornament. Here, we’ve got Tony Stark in the suit he wore in Avengers: Infinity War, as he faces off against Thanos’ quest for destroying the universe. But what sets this cool Iron Man ornament apart from other Iron Man Christmas ornaments we’ve seen in the past is that you can press a button to have his arc reactor and hand repulsors illuminate. He measures 2.8″ wide and 4.1″ tall, which is a pretty sizeable figure. Hopefully, we’ll see more great illuminated superhero ornaments from Hallmark soon, because we’d deck our tree out with glowing superhero stuff all day. 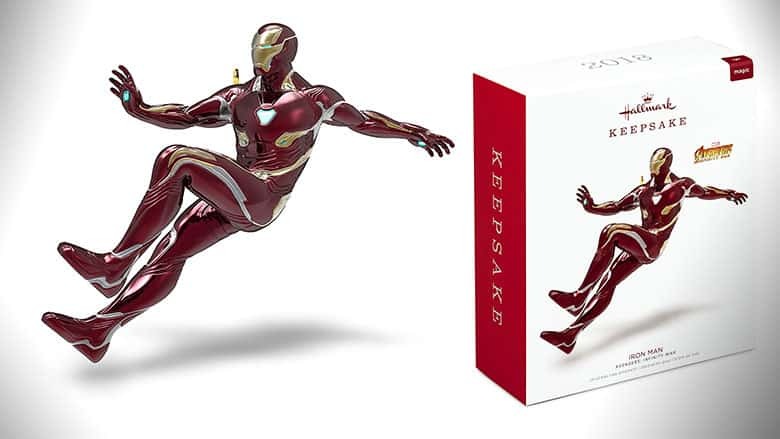 The new Iron Man Hallmark Keepsake ornament is available right now from Hallmark, Amazon, Thinkgeek, and more of your favorite online retailers.